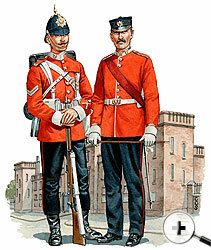 Corporal and Sergent Major c1900. In 1782 county titles were introduced for Regiments of Infantry, ostensibly to foster a connection with a particular county, but primarily to establish a base for the ever present problem of raising recruits. In April 1873, eight years before their final amalgamation, the 31st and 70th were linked together into 47 Sub-District Brigade. 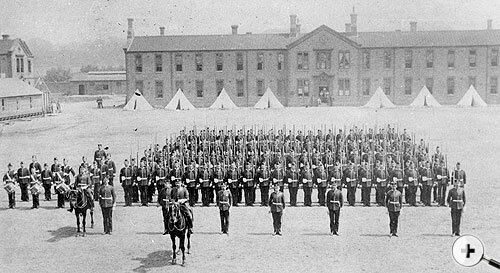 The Brigade Depot was established at Kingston and it was here that recruits for the two Regiments were trained. The barracks were designed by the Royal Engineers as a 'Brigade Depot Centre', and recruits for the 70th Foot, then in India were trained there. 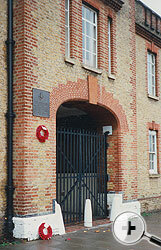 The barracks were built in 1874/75 and according to the Surrey Comet, 'it was the last word in barracks building for its time'. Its designer was a Major Siddon RE. 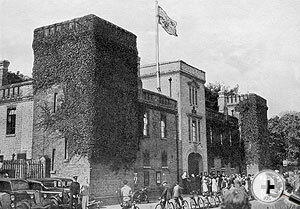 In 1962 all buildings in Kingston Barracks were demolished with the exception of The Keep. A stone, carved with the badge of The East Surrey Regiment over the archway, has, sadly, disappeared. The barracks had been built on agricultural land, the fields of Park Farm still being shown on three sides of it on a map of 1879. 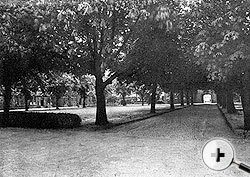 Park Farm belonged to lord Liverpool, the buildings cost £40,000. There had always been soldiers stationed in Kingston. Situated at a Thames crossing and on the road between London and Portsmouth, it was always a busy place. Seven Anglo-Saxon Kings were crowned in the King's town, and later its proximity to Hampton Court Palace probably added to its importance. In 1554 the protestant Sir Thomas Wyatt attempted to overthrow Queen Mary, but after burning the bridge his rebellion came to nothing. One hundred of his followers, including himself were executed in the town as traitors. It is recorded that regular troops, including the 8th Foot (later the King's Liverpool Regt) were stationed in Kingston in 1685. Most of his, standing army was usually on standby at Hounslow Heath which is only a few miles away. Regulars in those days were billeted out on the civilian population, this was one of the reasons why the army at home was unpopular and later why it was more convenient to keep most troops abroad. The Militia and Volunteer Units, being locals, could usually live at home or be billeted near by, so barracks were not required until Victorian times. Early in the 19th century there was a Militia Barracks in the Fairfield. The home of the East Surrey Regiment had an uninspiring name. Just 'The Barracks' always sounded rather dull. After the Second World War it was considered that something more exciting, such as 'Sobraon', or a World War Two battle honour would be an improvement, but all suggestions were ignored. To the left of the Keep archway were the guard room, cells, prisoner’s day room, and on the right armourers stores with racks for a thousand stand of arms, with another 2120 weapons accommodated over the whole of the upper floor. (They could presumably have been mainly Martini-Henrys, though the bottom windows had “iron bars and musket ball proof shutters”). In another fine building was situated the canteen, bar, tap room, recreation rooms and library, etc. Facing the Keep was a drill shed 130 feet by 20. 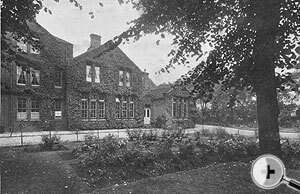 Another prominent building housed the hospital, which included two wards, infections ward and nearby a small mortuary and dissecting room. There were quarters for 31 married soldiers, and returning towards the entrance "commodious quarters" for the Quartermaster, CO's office, tailors' shop and offices for The Militia. Behind this was a wash-house, wool stores and coal yard. All the floors of passages and landings throughout were of artificial stone the cement from which this was made having been tested "by Mr. Onslow" to a pressure of 800lb to 1000lb. The single men’s blocks were fitted with ventilating stoves, the married men having a range, oven and boiler. The officers’ rooms had Captain Galton's patent ventilating grates. 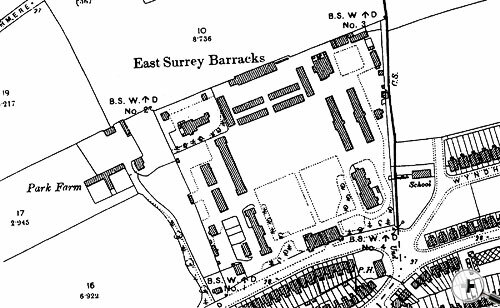 The playing fields, where it says East Surrey Barracks on the map must have been added some years later. There was a library, reading room and gymnasium. "Here young fellows are put through a course in gymnastics which very soon expands their chests and develops their muscles so that during their five or six months service as recruits a very great difference is made in their physique. The coffee-shop is laid out as a restaurant with marble-topped tables. Here a soldier may obtain extra food at extremely reasonable prices. A cup of tea or coffee is sold at a penny, and a large slice of bread and a liberal piece of sausage may be had for a penny ha'penny". The Cardwell Reforms finally abolished the old numerical titles, and the 31st and 70th, whose recruits had been training together for several years, were amalgamated to form the new East Surrey Regiment. Recruiting for the new Regiment began in 1881 and continued unbroken until 1958. (Each Regiment had two regular battalions, one at home and one overseas). Over the years the lay-out of the barracks did not change much. On the far side of the parade ground were the stout green-painted 'Crimea' huts. These huts were strangely named because the Crimean War (1854-56) was over well before the barracks were built. Maybe they had been in use in Aldershot or somewhere, then moved to Kingston and incorporated in the new barracks. A few years after World War II two of them became the H.O. and Officers' Mess of the 6th Bn The East Surrey Regiment. Beyond the Crimea huts was the playing field, and lastly the piggery. Sometimes there were one or two small R.A..S.C. units hidden away somewhere and usually known as the 'grocers', one of which was responsible for the rations used on the first Everest expedition. Much could be written of the many characters who at various times served at the Depot. For over 20 years Miss Dodd ran the NAAFI, helped by her pretty assistant, Doris. When the barracks closed down Miss Dodd was presented with a silver salver by the Colonel of the Regiment, Brigadier G. R. P. Roupell VC. Gold watches were also given to Bill Reid and Jasper Dineen. Bill Reid had served with the Regiment in Gibraltar in the twenties. Day in, day out, he worked stripped to the waist, in all winds and weathers, looking after the 'piggery' and the gardens. He could never be given an order. Everything had to be tactfully suggested to him so that in the end he would have thought he had worked it out by himself! Jasper Dineen had been in the Leinsters. (On the formation of the Irish Republic many Irish regiments were absorbed into the British Army). He was the QM's storeman. When the last but one OC Depot left (Major A C A Cater) he took Bill Reid with him to look after his fruit trees. This left the new OC with 60 pigs and no-one to look after them! Several National Service men eagerly volunteered presumably in order to get out of basic training. It did not work and as soon as possible the pigs were disposed of in Kingston market. 'Rosie' Sutton (Major A L Sutton MC) commanded during the war and later served as a Retired Officer until closedown. Always cheerful with an infectious laugh he was devoted to the Regiment. He spent most of his time as secretary to the Colonel of the Regiment. He had the highest standards, even if at times somewhat out of date. He did not take kindly to WRAC officers visiting the mess, or American officers coming to a guest night. He was quite bemused when he discovered that the last OC Depot was going to Kingston College of Art, to learn drawing and painting, one evening a week. He lived for the Regiment and all Surreys owe him a great debt. One officer to whom all Surreys owe so much was the late Peter Hill (Major P G E Hill). It was he above all who looked after the records and archives of the regiment for so many years. But for him, much of the Surreys history might never have been recorded. ORQMS Camp was not the smartest of soldiers, and it was unfair for him to be nicknamed "Harry the Tramp". During the war as a POW in the Far East he secretly kept records of other Surrey prisoners so that after the war their stories would not be lost. How he managed this under the eyes of the Japanese was extremely hazardous. His nominal rolls of the 2nd Bn The East Surrey Regiment during their tour in Malaya and as The British Battalion were accepted for records and pension purposes after the war. They are now in the possession of the Regiment. CSM Clemens was also a POW in Malaya. Before the war he had been Army cross-country champion, yet after all his hardships he managed the London Marathon for several years before his death. So many more names come to mind. The last QM was Jack Cox (Major J C Cox MBE) who had served in India, the Sudan, and France in 1939 as pioneer sergeant. ORQMS Hoddinott was the last of those in the orderly room - and not a bad cricketer. RSM Woolley came from the Grenadier Guards and served with the 1st Bn in Sicily, and all the-way up Italy. The last RSM was Peter Collman a model of smartness and efficiency. The home of the Regiment is now no more, but apart from its uninspiring name it was never a dull place. Most Surreys have happy memories of having served there. Connections with the Regiment still remain. The Regimental War ·Memorial consists of the Trinity Chapel in the parish church, and at the entrance the memorial gates with The East Surrey badge. Of the barracks only the Keep now remains as it has been for over 100 years. 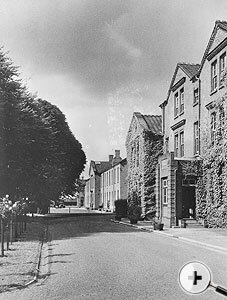 The rest of the buildings are now demolished and the 14 acres turned into attractive married quarters. In 1952 the Mayor of Kingston-upon- Thames referred to the East Surreys as 'our soldiers'. Although the name has changed so it must remain. The Plaque on The Wall of The Keep. 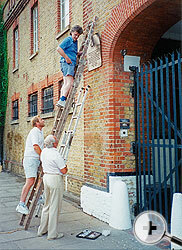 In 1995 a plaque was unveiled on the wall of the Keep by the Mayor, in the presence of many old soldiers and Les Wilson (Lt Col L M Wilson MBE) who arranged and organised the occasion. Among other sentiments it states that this was the home of the regiment between 1875 and 1958. Thanks to - The Surrey Comet 1874, Major P G E Hill for extracts from 'Farewell to Kingston', The Public Records Office, Kew. Mr T Everson. Local History Officer. 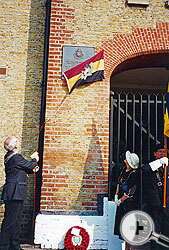 Kingston Museum and Heritage Service and the Trustees of The Queen's Royal Surrey Regiment museum, Clandon.